For Manual High School basketball coach Wayne McClain it is three-for-three in Tri-County Male Coach of the Year honors. In an unprecedented success story, the long-time former Manual assistant coach has been head coach for three seasons and has won three state championships! Each of the first two won him Tri-County honors and so has the third, the first time anyone has been honored three years in succession. 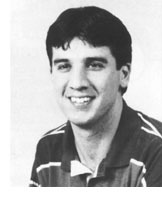 The 1996-97 season saw Manual go 31-1 to raise McClain's three-year record to an amazing 94-4 (he was 32-2 and 31-1 in his first two seasons). The Rams were 15-1 against ranked teams from eight states. In the state finals Manual whipped Chicago Young 51-46 in the first round, staged a brilliant rally to down Harvey Thornton 65-62 in the semi-finals and wound up the second state finals played in Peoria with a 47-43 win over Aurora West. Manual was named the No. 1 team in the nation. When Gary Strait of Peoria finished last year's league bowling season in the early spring of 1998, he had carved out a special spot for himself in the Greater Peoria Bowling Association. The 28-year-old lefthander had ended the season with a 231 average for 84 games, the highest average in the long history of the GPBA. 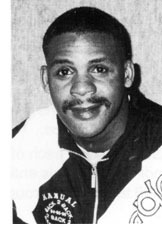 And for his historical achievement, Strait is the Co-Tri-County Male Athlete of the Year for 1998. Bowling in the Checkmate League at Mt. Hawley Bowl, the 6-foot-3, 225 pound Richwoods High School graduate actually was on target to flirt with a 240 average before a late-season slump. He had his average up to 238 with two-thirds of the season over but then hit an eight-week slum. "I kept wondering when I was going to have a bad night," he said. "It never came until those last eight weeks." After a 539 series, his low mark of the season, he went with a new ball, produced a 791 series the first time out and got his average back over 230. Beginning his league career when he was 17, he has had four 300 games and four 800 series. He is the only bowler in Peoria to ever author back-to-back 800 series. He has received two awards of merit in the last three years for high average in the GPBA, a 228 and then his recordsetting 231. He also received an award of merit for the highest series in the city, an 837.